Right Guard Review | Worst deodorant I ever tried! Worst deodorant I ever tried! I had no issues with the effectiveness of the deodorant but I threw out half a stick, which is very rare for me. I will usually finish a product even if I don't care for it. This deodorant leaves a sticky, gooey film which does not wash off in a shower. Several applications of soap would not remove it. Trying to wash it off gets it on one's hands and then spreads the goo to other parts of the body. The several times I used it I ended up feeling sticky after showering. I would never buy this product again! I can't get it off! 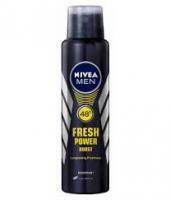 Nivea Men Fresh Power Boost Deodorant 3.